The Walkabout™ is a stance and reciprocating gait stabilizing orthosis, designed to give qualified individuals with paraplegia, spina bifida, multiple sclerosis, transverse myelitis and other forms of degenerative neuromuscular disorders, the opportunity to stand and move about unassisted. In addition, the Walkabout™ can be used as a rehabilitation device for those with longer-term injuries. The Walkabout™ is currently sold into many countries including the USA, China, UK, Spain, Greece and the Netherlands. The physical benefits to the Candidate of being upright and more active. Allows the Candidate to use the parts of the body that still has function. The first objective of the Walkabout™ is to allow the Candidate to stand in an upright position. 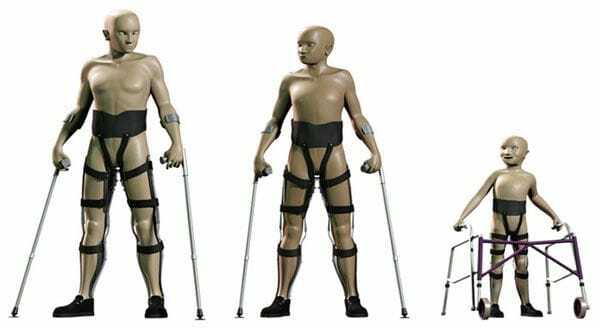 The Second objective is to allow the Candidate to move independently with only the use of crutches. A secondary design element of the Walkabout™ is to enable the complete Walkabout™ Orthosis to be worn under clothing. This was a primary objective of a Walkabout™ Candidate who attended her Sister’s wedding as a Bridesmaid, standing in full dress. The Walkabout™ is not in competition with the wheelchair; rather it supplements the wheelchair as an additional mobility device available to the Candidate. Because the Walkabout™ is hinged under the pelvis, the centre of continuity extends to the hips. This allows the Candidate that is wearing the Walkabout™ to utilise all of the upper part of the body that is not paralysed. Whilst the Walkabout™ is only suitable for a subset of the total population of paraplegics, multiple sclerosis sufferers and people with cerebral palsy and spina bifida; for the candidates that are suitable to use the Walkabout™, a major positive impact can be made with their lives. For the Walkabout™ System to work, the Walkabout™ Unit must be attached to the medial uprights of a set of KAFOs. 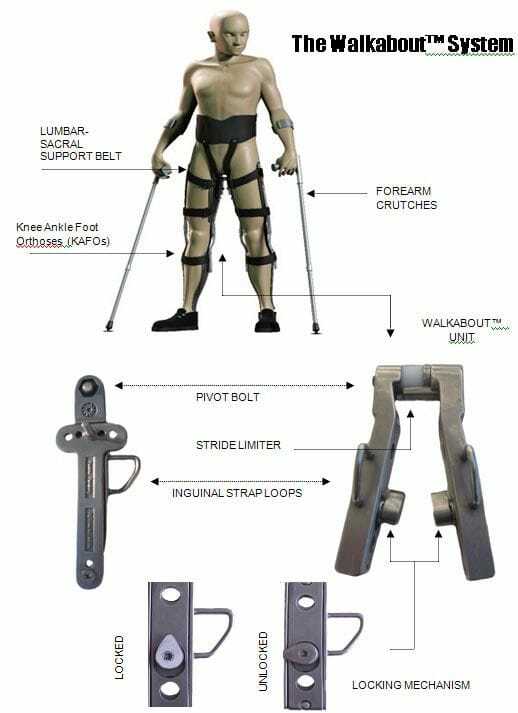 The construction of the KAFOs and the fitting of the Walkabout™ is usually undertaken by trained Orthotists. If you would like any further information or contact details in respect of the Walkabout™, please contact us. The Walkabout™ is registered with the TGA ARTG 118953 .